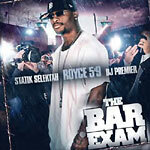 Royce Da 5'9, Statik Selektah and DJ Premier team up to deliver the mixtape you've been waiting for! Twenty tracks of new and exclusive material. With a seal of approval from Primo himself!